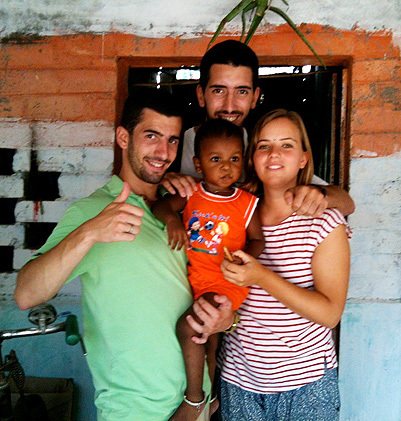 Last summer, Joan Ortega volunteered five weeks in Vedanthangal, along with his brother Jaume and Núria Armengol. Our experience in India began at the Chennai airport, where Lluís along with an Indian driver were waiting for us. The first impression was, to put it in one word: CHAOS - Cars, buses, motorcycles and auto rickshaws driving as if it was the end of the world! The situation improved considerably when we reached Vedanthangal, the place that would be our home during the five following weeks. Vedanthangal is a small rural village, quiet and cozy, where our Foundation is located, having a house for volunteers, a nursery school and the office. In the first two weeks of the stay we enjoyed the company of a Polish volunteer who had already been for a month in several work camps in different parts of India. During these first weeks the description of our daily routine might be the following: we woke up at about 8:30 in the morning, we had breakfast at the home of Fatima (a family of Indian Muslims that ended up integrating us as family members), after that, we used to prepare some material for the activities we performed at the after-school support centres or the nursery school. We did other office tasks such as developing a spreadsheet to support the reporting process on infant nutrition. We also played with 40 kindergarten children during their leisure time. During lunch time, at 1 pm, we had long conversations with Fatima, Mumtaz (her daughter) and Rose (her daughter-in-law) on any topic, such as the memories they had of different volunteers or their plans to arrange Mumtaz’ marriage. After lunch, from 3 to 4 pm, we used to go to a Government school to organize games and sports with the children. After that, we returned to our "palace" where, after a good sweat, playing with children, we had a shower. Around 5:45 pm Yuvaraj or Kalaivani picked us up and took us to one of the 14 ‘after-school support centres’ run by the Foundation to conduct a variety of activities. The activities ranged from drawing whatever the children liked, to organize a team competition testing their knowledge on geography, mathematics and English. It was also useful to assess their level in various disciplines. Finally, at the end of the day, we returned exhausted to Fatima’s for dinner. On the weekends, the kids have no school, so we could visit tourist sites that Lluís recommended to us, such as Madurai, Thanjavur, Mamallapuram, Puducherry, places with a special charm. Once these first three weeks were over, five other volunteers joined us for the work camp; the human group that we formed was, and still is, amazing! The work camp consisted of performing the same tasks I mentioned above, adding other ones, such as accompanying Laia Foundation’s health workers to measure children between 0 and 5 years to prevent problems of malnutrition, planting trees around the homes of the Foundation’s students and provide awareness on its importance, making a video to raise funds in the U.S., etc. But perhaps the activity that surprised me the most was taking the kids on an educational tour. During the tour, we visited a snake park and then a number of beaches including Mamallapuram. The children were so excited that the bus seemed a nightclub, everyone dancing, laughing and singing like any volunteer had ever seen before, it was great. Also, as during the first weeks, we did some sightseeing in scenic places like Thirupati or Thiruvannamalai during the weekends. To sum up my experience in India, I would say that it was so amazing due to, primarily, three factors. First, the affection we received from the children that were coming to our place every morning, afternoon and evening, the children that we played with at the Government schools and at Laia Foundation’s centres, the nursery school children and Fatima’s family. Second, the extreme openness and willingness of the Foundation’s staff, especially Lluís and Yuvaraj, where any idea is listened to and taken into account. I come back more convinced that everything can be achieved, and if the people around you are like the Foundation’s personnel, it may even seem easy. And third, I would like to thank the work camp volunteers, people who want to make this world a better place with what we have in our hands.